what does self care look like/feel like for you? To me self-care is all about seeking and creating balance in my life. It’s spending time with people you love and people who inspire you. It’s finding time for nature and meditation. It’s finding time to give to you but also to give to others. It’s knowing that sometimes the medicine you need is not the medicine that you are most excited to take. It’s taking time for self-work and self-discovery and sometimes for self healing. It’s finding the balance between what you need in the moment and what those around you on a personal level, community level and global level. Currently my self-care practice consists of getting to my yoga mat once a day, even if it’s only enough time to meditate and breath. I also make time for self-work and self study; this is not fun, but once you dig through it great things can grow and you move forward on your own personal journey. I make time to be in nature (likely with my dogs) as often as possible. I take time to take care of those I love and to surround myself with the family and friends that are most important to me; my loving partner grounds me in that everyday and I am so grateful for that connection. I have also found that self-care can be as simple as a cup of coffee with a good book or creating a new knitting project. The best way that I have found to care for myself is expressing gratitude. Taking time at the end of each day to go through all that I am grateful for and all the successes (big and small) as well as all the lessons that came my way. Gratitude is balancing and healing. For me it’s self care in it’s purest form. It depends on what I need in the moment! I keep a running list of ideas in case I hit a low point where I don’t know what is needed to resurface. The newest practice is ‘angry dancing’. I grab a couple of maracas (or just make fists with my hands) and – as aggressively as possible – dance! Basically, it looks like kicking and punching the air, with a few hip rotations to keep it dance-like. It is quite silly and fun but also allows my body to externalize any built up tension, anger, and aggression. Self care looks like putting myself first. We often tend to take care of the world around us before taking care of our own needs, so I need to carve time out of each day to focus on me. Self-care is a radical practice. It feels brave, satisfying, and rejuvenating. Self care to me, means taking the time to do things that are going to benefit my physical, emotional and mental health. Whether it’s going to a gym class, taking the dogs for a walk, getting a massage, going to the GP to get a check up or volunteering to help my partner or family with something - all of these things in one way or another ensure I’m doing okay. One thing I try to remember as part of my self care practice is that yes, I can do anything - but I can’t do everything at once. Feeling overwhelmed by all of the demands we face as young adults can be tough, and it’s a fine balancing act I’ve never been able to master. Finding a resolve with this and cutting myself some slack is imperative to my overall well being and self care. I've been thinking about self care a lot lately because to be honest, I haven't been practising it at all lately. Starting a second business, running a not-for-profit and working day jobs to pay the rent, all my exercise, me time and healthy window has completely gone out the window. I can tell it's taken a toll as I feel so much more sluggish and exhausted than I usually would. So how am I going to turn this around?! I'm going to start focusing on the fuel I put into my body by getting back on the healthy eating train. I'm also going to make sure I take the time to switch off after work - no more late nights working away at the laptop (not until it's absolutely necessary to smash something important out). Most importantly, I'm going to let go of all the self-imposed deadlines I create for myself -- all the goals and business deadlines I set, but which at the end of the day really don't matter if they're pushed out a few months. I'm going to settle into letting things happen slower than I would like. Lastly I'm going to create more time for girl dates because they are the best cure for an overworked soul! This is what self care feels like to me. It was in Victoria, I had been exploring and found a Pilates studio - here I am after class. Sweaty, sun in my eyes, joy in my heart. This moment contains so many things I need for a happy life. One of the biggest acts of self care for me, is exercise. Running and Yoga are my two favourite ways to steal some time for myself. Both of these act as forms of meditation for me. It connects to me to my breath, and gets those stress busting, feel good chemicals running through my bloodstream. About 6 months ago I got chatting to one of the Mums from my youngest daughter's school (Megan), and we were both sharing how much we love exercise, and how it makes us better Mothers, for it helps equip us with the high levels of energy and patience needed to be a Mum. 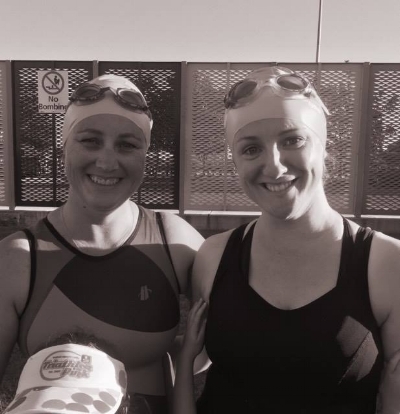 Megan is a triathlete, and Mother to two gorgeous girls. She also suffers from Rheumatoid Arthritis, but never lets that get in the way of her athletic pursuits. I find that incredibly inspiring. I told her how I've always wanted to do a Triathlon, but my poor swimming ability has always held me back. Megan had just become a certified swimming instructor, and without hesitation said "I'll teach you!" I hesitantly agreed, as I didn't want to take up any of her precious spare time, as I know how hard it can be to find time when you're a working Mum. She proceeded to send me messages urging me to come to swim training. Even offered to pick me up. I knew immediately her offer to help me was genuine and from the heart. We then began to swim together at least once a week, without fail. Even on freezing cold nights when people wouldn't dream of dipping their toes in the water. I set a goal of completing Triathlon Pink on the 9th of April. Megan encouraged me to do the Ultra Distance, and I thought she was crazy. She said I could do it thanks to my running background. She had complete faith in me. So yesterday was the big day, and Megan was there for me every step. From racking my bike, to taking me through some relaxing deep breaths poolside when she could see the fear in my eyes. After smashing the Ultra Distance herself, she stood right at the finish line and waited for me to finish. Greeting me with a huge, sweaty, loving congratulatory hug. I'm so grateful to have this strong, selfless woman in my life. She reminds how important it is for us Mums to practice self care. We both want to be positive role models for our daughters, so they also care for their own mind, heart and overall health. Ever since I started approaching my life from a place of feeling, instead of checking goals off a list, I have put a lot more emphasis on my self-care practices. I know that everyday I want to feel connected, inspired, passionate, creative, and be learning in my life- so I try to create that for myself each day. This happens through reading, journaling, meditation, yoga, sweat, and often sticking up at a coffee shop to work on my passion projects. With living a full life, self-care is something I find hard to slow down for, as I am as guilty as anyone to pull the “I don’t have time card”. I realize however, that when I don’t take time for self-care, that I am not living into my greatness, which doesn’t create the space to fulfill my goals, work towards my vision, or serve people. I’ve had to be reminded that the burnout from “doing it all” doesn’t elevate or inspire those around me. I practice showing myself love, so I can share that. To me, self-care is treating myself with the same love, respect, and generosity that I extend to others. Self care means allowing myself to take the time to listen to my body and mind, identify my own needs and then take steps towards meeting them. It means continuously working to become more self aware and then doing the activities, focusing on the thoughts and living the behaviours that nurture me and bring a sense of peace and well being. Self-care is being honest with myself about what choices are healthy and kind, and then putting those into action. It can mean a morning check-in of what I need that day and a nightly reflection of gratitude, mindfulness and introspection. It can mean getting up early to have a leisurely morning or choosing to sleep longer. It can mean prioritizing my daily yoga practice and activity in nature, and can also mean the understanding, love and kindness needed when making the decision to get more rest. It can mean time alone or time with loved ones. It is being flexible with my shifting needs and accepting whole-heartedly whatever my self-care practice looks like each day. Caring for ourselves is one of the most important things we must do - for ourselves, by ourselves. We spend much of our lives nurturing and caring for others, and it can be easy to neglect our own needs. But, when self care is a lifestyle shift rather than a temporary solution, it can be medicine for ourselves and those around us. Practicing self-care shows that we believe we are each valuable, worthwhile and deserving persons - and in doing so, we extend this message to those around us, all while strengthening our own reserves and becoming our best selves. To me self care is all about being gentle, forgiving, and patient with myself. It's about giving myself permission to enjoy the process of growing into the woman I want to become, and letting go of expectations. It's about staying in tune with my body, mind, and spirit to see where I'm out of sync or lacking balance! By checking in with myself through simple journal exercises, meditations, and gentle movement, I am able to tell what part of my Self needs more attention. As a new mama and busy entrepreneur, I don't have too much free time for daily self love rituals, but I try to maintain a healthy diet and follow our GirlTribe meal plan, I never miss my daily supplements, and I love to use my GirlTribe planner to stay on track with daily gratitude practices!! I also recently started keeping my phone downstairs and on airplane mode overnight, which has made a huge difference in my screen time before bed and first thing in the morning! Self love is all about loving yourself harder, not putting pressure on yourself to DO MORE!! I make sure not to beat myself up when I miss a workout or forget to send an email. We are all Goddesses doing our best! Learning to be gentle with yourself regardless of where you are at in your journey will make each day more enjoyable. I practice self care in so many ways, but meditation is my lifeline. I make time every day to sit, get quiet, and connect with my breath. Vedic sages believed that the quality of life directly depended on the quality of the breath. I believe it is important to develop an intimate relationship with our breath, and to be grateful for every new breath we are granted, as we never know when it will be our last. Without it, we are nothing. Our life depends on it. Self care is meeting myself with compassion and kindness in moments of insecurity, shame, guilt, doubt, and any other self limiting beliefs that may come up. For me, self care is about putting my health and happiness above everything else. It is about taking the time to nourish myself so that I can thrive in all areas. From the basics of eating well, sleeping well and taking care of my physical body to making sure I have enough down time doing things that resonate with me. Some of my favourite things to help me unwind include spending time with my family and friends, having an epsom salt bath, listening to podcasts, reading, cooking, candles and diffusing lavender oil. I also love being outside and going for long walks. Another non negotiable for me is spending at least a couple of minutes before I leave the house each day connecting to my breath. For me, self care is all about feeling at one with my body and mind so that I can live life to the full and be the best version of me in everything I do. To me self care is about listening to your body and mind and allowing yourself to do what you feel you need in that moment to pick you up or keep you smiling. For me it can be as simple as going for a walk or putting my favourite music on to forget for a few moments all of my worries......I'm one of those worriers of the world! While life gets in the way more than I would like, I practice self care through being active when I can. Yoga and Pilates are my personal favourites and when my bank account is happy a massage is my extra special treat. I think its important to take time for yourself and just focus on you.